The children and staff of Oxford’s newest day nursery were treated to a visit and official opening on Thurdsay 19 January 2017 by Caroline Dinenage MP, parliamentary under secretary of state for women, equalities and early years. The Old Station Nursery’s latest nursery, which is its fifth, opened its doors at The Oxford Science Park on 3 January 2017 following a £100,000 refurbishment that included interior decorating throughout, all new equipment, and garden refurbishment. The nursery opened to meet the growing demand for childcare spaces in Oxford. The new Oxford nursery provides day care to parents and carers both on the Park and those in the surrounding area for up to 72 children from birth to five years old. 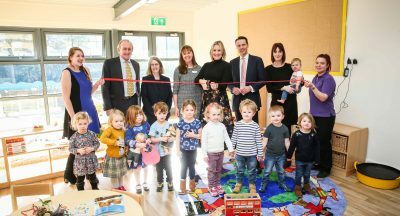 The official opening was part of a wider opportunity for the Minister to learn more about Oxfordshire’s childcare provision, which currently includes 350 early years and childcare providers, 250 schools, many with nursery classes, six nursery schools and 650 childminders. 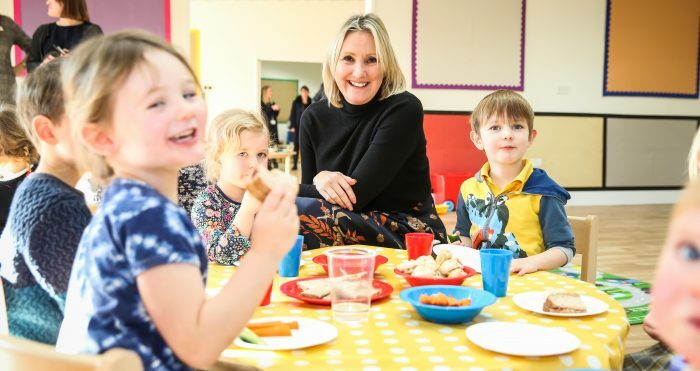 Minister for the early years, Caroline Dinenage, said: “Making sure our children learn, develop and flourish at this critical time in their lives is vital – I’m privileged to be meeting so many dedicated early years staff who show such passion for their job in my visits around the country. Oxfordshire County Council’s Cabinet Member for Education Steve Harrod said: “We very much welcomed the opportunity to show the Minister just a snapshot of some of the great things that are happening to provide day care for Oxfordshire’s children. “It is absolutely vital that children get the best possible start in life, and high-quality early education can be crucial in making a difference to children’s achievements later in school. To request a brochure or arrange a tour of the new Nursery, please contact: osp@theoldstationnursery.co.uk or call 01865 777 167. Photo caption: Minister for Early Years Caroline Dinenage opened The Old Station Nursery at The Oxford Science Park. Left to Right back row: Ramona Kanpschuster, Nusery Manager; Steve Harrod, Cabinet Member for Education, Oxfordshire County Council, Christine Malone, Oxfordshire County Council; Sarah Steel, MD, Nursery; Caroline Dinenage; Piers Scrimshaw-Wright, MD, The Oxford Science Park, a new mother and her baby, Louise, Nursery team.